Since Kiraly pointed out the beneficial role of collaboration in translation training, increasingly more attention has been paid to the potential benefits of peer collaboration. While Wang and Han studied translation trainees' explicit perceptions of any benefits resulting from peer feedback, the present contribution first investigates the role of translator's implicit perceptions of reviewer expertise in the effectiveness of a peer comment in a case study. It then inquires into the number and type of peer feedback comments in relation to whether the target language that is to be reviewed is the reviewer's L1 or L2. Here, two data sets are hypothesized to yield similar results: (1) a set of native and non-native reviewer comments and (2) the comments written by translators in a direct translation situation and in an inverse translation situation. 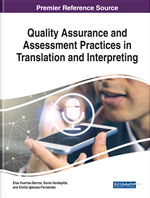 Findings were surprising, however, and professional, methodological, and theoretical research implications for translation and revision competence models are suggested. In the preceding decades, many didactic and pedagogical studies have pointed out the beneficial effects of collaborative work in education on the development of various transferable skills (Tudge, 1990; Berg, 1999; Paulus, 1999; Tang & Tithecott, 1999; Wells, 1999; Scardamalia, 2001; Swain, Brooks, & Tocalli-Beller, 2002; Starke-Meyerring, 2008; van Zundert, Sluijsmans, & Van Merriënboer, 2010). Recently, various translation scholars, too, have argued for the introduction of collaborative projects in translation training (Kiraly, 2001; González Davies, 2004; Muñoz Martín et al., 2007; Pavlović, 2007; Kenny, 2008; Lindgren, Sullivan, Deutschmann, & Steinvall, 2009; Risku & Dickinson, 2009; Zili, 2009; Desjardins, 2011; Huertas Barros, 2011; O’Brien, 2011; Babych, Hartley, Kageura, Thomas, & Utiyama, 2012; Gambier, 2012; and OPTIMALE WP 5.4, 2013a-c). The present empirical studies, however, will focus on the process of the student’s writing act (Toury, 2012) and, in particular, the revision phase in a translation process, which has been brought to the foreground by Mossop (2010) and Robert (2012) and Robert, Remael, and Ureel (2016). Combining both revision with peer collaboration in a translation setting has already been broached by Wang and Han (2013), who investigated students’ perceptions about receiving peer feedback on their own translation, giving feedback on a peer’s translation and perusing other students’ work. They found that the three activities combined were especially rewarding, appreciating the alternative approach to teacher-centered education, and judging the more passive events of perceiving reviews on their own work and scanning their peers’ work as more beneficial than the more active engagement of giving feedback themselves to others. A more systematic approach to collaborative translation exercise in a complete course design is described in Vandepitte (2016), who covered learning outcomes, preparatory exercises, an introduction to peer feedback, and Ghent University students’ activities, who not only collaborated with each other in class, but also at home online either with each other or with students from North Dakota State University at Fargo. And Vandepitte and Gonzales (2017) have shown how the introduction of translation by peers and their feedback may lead to deeper insight into writing for different audiences and, in particular, into such linguistic matters as how to formulate definitions.